1월 18~20일 까지 Atlanta Georgia에서 “사명으로 역사를 이끌어가는 여성들”이라는 주제로 한인여선교회 전국연합회 임원회 및 수련회로 모였습니다. 실행위원들은 17일부터 모임이 있었는데 이날 오전 Atlanta에 추위와 눈으로 공항이 폐쇄가 되었습니다. 오전에 도착하려던 두 총무님은 비행기 안에 갇혀 무척 고생하고 오후 5시에나 도착을 했습니다. 여러 다른 지역에서 오시는 분들도 계획대로 도착하지 못했습니다. 참 여선교회원들은 대단합니다. 날씨가 나빠도, 몸이 아파도, 그리고 식구들이 아파도, 여선교회 일을 우선으로 삼고 이렇게 전국에서 모여 선교를 하는 “사명으로 역사를 이끌어가는 여성들” 입니다. 2003년부터 14년동안 여선교회 임원으로 봉사하면서 참으로 많은 것을 배우고 깨닫고 성장했습니다. 처음으로 여선교회의 목적과 역사를 배우고 이런 여선교회로 불러주신 주님께 너무도 감사하고 기뻐서 정신없이 달렸습니다. 무슨 일이든 맡겨주시면 최선을 다해 해내곤 하였습니다. 그리고 지난 2년 동안 사실 저 자신은 여선교회를 떠나고 직장을 은퇴하며 남은 삶을 어떻게 주님께서 인도하실까? 기도중에 다시 임원으로 불러주셨습니다. 이번 임원회는 저에게 또다시 도전을 주는 모임이었습니다. 새로운 임원들이 많이 오신 것을 보고 주님이 전국연합회를 얼마나 사랑하시고 계신지를 보며 부족한 저를 또다시 불러주신 주님께 감사드립니다. 매일 기쁨과 감사와 열정으로 참여하는 임원들을 보며 더욱 은혜받는 시간을 가졌습니다.새로 중한 책임을 맡으신 이성은 회장님, 말씀 하실 때마다 눈물을 보이시며 감사하시는 모습, 이렇게 눈물과 겸손으로 전국연합회를 이끌어가는 회장님을 우리 주님이 얼마나 사랑하시는가를 보는 은혜의 시간이었습니다. 아름다운 찬양, 각 지역 연합회를 알리며 서로에게 도움이 되었던 지역 연합회 보고의 시간, 웃음과 재미, 벌칙과 상품으로 시간 가는 줄 몰랐던 친교의 시간, 또 미리 임원들이 김옥라장로님의 책을 읽고 와서 함께 이야기를 나누며 나는 어떻게 사명을 감당할까? 다짐해보았던 시간, 성경공부, 공동체 훈련, 전국연합회 역사와 사역, UMW 시간, 섬김의 지도자의 시간, 개회 예배, 아침 예배, 저녁 기도회 그리고 폐회 예배, 그리고 빼놓을 수 없는 풍성한 음식으로 우리를 기쁘게 해주었던 식사시간, 그리고 평가회 시간에 감사와, 격려와 새로운 마음으로 의견과 결단을 내려주신 임원들, 모든 순서 순서에 성령님의 함께 하심을 충만히 느낄 수있었던 임원회 및 수련회였습니다. 이번 임원회에서 가장 신나고 우리가 힘차게 준비할 수 있는 2023년 전국연합회 Assembly를 계획할 수 있었음을 또한 감사드립니다. 2 박 3일이 이렇게 빨리 지나고 이제 또 각자의 삶과 지역 연합회로 흩어지는 임원 한분 한분을 눈동자같이 지켜 보호해 주시기를 우리 주 예수그리스도 이름으로 기도합니다. 선교를 위하여 같은 마음, 같은 비전, 같은 열정을 가지고 겸손과 순종으로 주님의 백성을 섬기겠노라고 “주여 내가 여기 있나이다. 부르심을 들었나이다. 보내소서 주의 백성 섬기오리다” 라는 찬송을 또 불렀습니다. We gathered at the NNKMUw officers’ retreat on January 18-20 in Atlanta, Georgia on the subject of "Women who lead history by Mission". The executive committee gathered from the 17th, and the airport was closed in Atlanta due to the cold weather and snow. The two executive directors who were about to arrive in the morning had a hard time traveling because they were trapped in the airplane and it was 5 p.m. when they arrived. Officers from different regions could not arrive as planned. However, the members of the NNKUMw are amazing. We are the “women who lead history by mission”. We gathered from around the country and prioritized missionary work even when the weather is bad, when we are sick, and when our families are sick. I have learned, realized, and grew so much by serving as an officer for 14 years from 2003. For the first time, I learned the purpose and history of the Women's Mission. I worked hard because I was so grateful and joyful to the Lord who called me to the NNKUMw. I did my best when I received anything to do. Actually in the past two years, I prayed to God on how He will lead the rest of my life, after leaving the NNKUMw and retiring from my job. He called me again as an officer during my prayer. This officers' retreat was a challenge for me again. I am grateful to the Lord for seeing how many new officers are coming and seeing how much He loves the NNKUMw and calling me again. Every day I was blessed to see the officers involved with joy, thankfulness and enthusiasm. President Grace Sung-eun Lee, who has taken on a new important position, expressed her gratitude with tears whenever she spoke. It was a time of grace to see how our Lord loves the President, who leads the NNKUMw with tears and humility. We had a beautiful praise time, a local network reporting time that helped each other by announcing the local network and a fellowship time. I lost track of time with laughter, fun, penalties, and prizes. Also, the officers prepared by reading the book of Elder Ok-ra Kim, and had time to share and talk about how we would fulfill our missions. 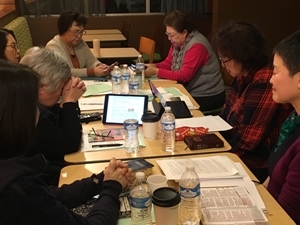 We had Bible studies, a community building training, learned about the NNKUMw’s history and ministry, a UMW time and a workshop for servent leadership. There was an opening worship, morning worships, evening prayer meetings, and a closing worship. I cannot forget the meal times that made us happy with the abundant foods. Not to mention, the executives gave thanks, encouragements, opinions and decisions with new minds during the evaluation session. It was an officers' retreat where I could fully feel the Holy Spirit's presence throughout the whole time. I am also grateful to have been able to plan the 2023 NNKUMw Assembly, which is the most exciting and vigorous preparation of this officers' retreat. I pray that our Lord Jesus Christ protects every one of our officers as they are now dispersed into their lives and local networks. We sang a hymn called "Here, I am Lord. I have heard your call. Send me to serve Your people." to promise to serve the Lord's people with humility and obedience with the same heart, the same vision, and the same passion for mission. Lord, lead us! 전국 연합회는 하나님의 영광을 위해 쓰임받기를 원합니다. 같은 마음과 같은 비전으로 선교 위해 나가기 원합니다. 우리의 삶으로 보여지는 저희들 되겠습니다. 더욱 화합하고 협력하는 모두가 되길 기도드립니다. 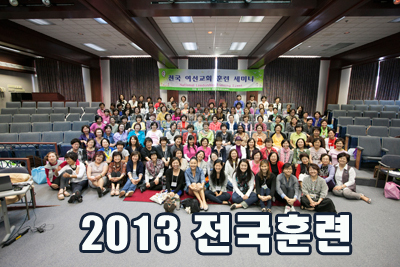 여 - God, who called us into the Women’s Mission! The NNKUMw wants to be used for the glory of God. 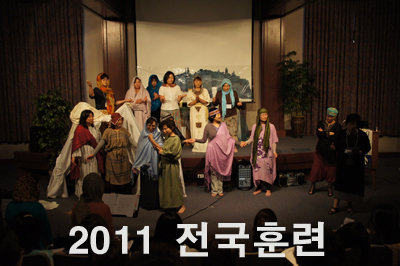 선 - We want to go on a mission with the same mind and vision by establishing missionary school as our learning ground. 교 - Not just to be educated, but we will be the ones who make change in our lives. 회 - We pray that all of us will be in harmony and cooperation by communing with our fellow members. 새해가 오면 매년 우리는 어떤 새로운 모습을 갈망하며 온갖 계획을 하고 그것을 이루기 위해 많은 꿈을 꾼다. 그러나 개인적으로 이번 새해는 언제 왔는지조차도 모르고 슬그머니 와 버렸다. 계획한 일도 없고 꿈을 꾸지도 않았다. 12월에 오직 하나뿐인 나의 엄마를 천국으로 보내드리고 아무런 의욕도 생각도 없이 그냥 시간이 흘러가서 보니 우리 여선교회의 매년 첫 행사인 새해맞이 날이 돌아온다고 회장님의 경고 메시지가 “까뚝 까뚝” 하며 울리는 걸 듣고 아아! 한복을 꺼내야 하는구나 하며 준비를 했다. 한복을 차려입고 나가니 화창한 날씨의 시원한 겨울 공기가 기분을 상쾌하게 해 주었다. 라팔마 교회에 도착하니 새로 지은 친교회관이 우뚝 서서 손님 하나하나를 맞이해 주었다. 공사가 완전히 끝나진 않았지만, 우리 여선교회 행사를 위해 처음으로 손님맞이를 하겠다고 라팔마 교회의 목사님과 모든 성도님이 기꺼히 오픈 해 주셨다. 얼마나 행복한 우리 여선교회인가! 예배순서 중 우리가 항상 읽던 연합 감리교 여선교회 목적문을 읽는 중 가슴이 찡 해왔다. “연합 감리교회 여선교회는 여성의 공동체로서 그 목적은 하나님을 알고, 예수 그리스도를 통하여 온전한 인간으로서 자유를 체험하며, 창조적이고 상호 협력하는 친교를 도모하고, 교회의 세계 선교에 동참함으로써 선교에 대한 이해를 넓히는 데 있다.” 우리 여선교회가 하는 모든 일이 이 함축되어있는 목적문 안에 다 포함되어 있었다. 이 문장을 읽을 때마다 어쩜 이렇게 잘 정리된 목적문을 만들었을까 하며 감탄한다. 또 이것을 읽으며 내가 왜 하나님의 계획안에서 지음을 받았나 하는 것도 깨닫게 된다. 2부 순서 때는 젊으신 이문영 목사님과 함께하는 세미나가 신선함과 많은 것을 공감하게했다. 젊은 여자 목사님이라는 것도 마음에 들었지만, 세미나의 주제, “신앙의 유산: Knowing and Doing” 도 큰 공감을 갖게 했고 도전받는 시간이었다. 젊은 세대와 교회관에 대한 이슈는 정말 100% 공감이 되었다. 우리가 무엇을 잘못했기에 젊은 세대들이 교회를 점점 떠나고 있을까 하는 문제를 숙고해 볼 때 나 자신도 가해자라는 생각에 부끄러움을 느꼈다. 두 아이를 키우고 있는 엄마로서 과연 내가 아이들에게 건강한 영적 유산을 물려줄 수 있나 하는 질문을 해 보았다. 정말 우리가 알고는 있으면서도 실행하지 못하는 그런 안타까운 부모들은 아닌지 하는 자문을 하게 되었다. 그리고 구체적으로 어떻게 해야 하는 것도 배웠다. 부모 세대들의 언행의 일치가 없음은 물론 우리 아이들에게 하나님의 말씀을 가정에서부터 가르치지 않았던 것이 요즘 젊은 세대들이 교회를 떠나는 이유 중 하나임을 깨닫게 되었다. 우리 아이들 세대와 좀 더 효율적인 소통을 해 보려고 우리가 먼저 노력해야 하겠다. 젊은 세대들에게 교육하려면 우선 그들과 관계를 만들고 쌓아야 하겠다. 그들과 우리 세대의 우선순위도 타협해야 할 줄 알아야 하고… 머리로만 아는 것이 아니고 이제는 우리가 모두 행함으로써 우리 젊은 세대들이 교회를 떠나지 않고 하나님 앞으로 다시 나오도록 끊임없는 노력을 해야 하겠다. 우리가 새것이 되기 위해 아무리 꿈을 꾸고 계획을 하여도 그리스도 안에 있지 않으면 새로운 피조물이 될 수 없다는 걸 안다. 우리 여선교회도 그리스도인으로서 주님 안에서 모든 걸 계획하고 하나님께 영광 돌리기 위한 도구로 쓰임 받기를 이 새해 첫 달에 기도한다. Whenever the New Year comes around we wish for some kind of new look, and we plan for the new resolutions and dreams because of those resolutions. However, this new year, I have not had any new plan nor resolutions. I don’t even remember when the new year came by. Since I sent my mom to heaven in December, I had no desire for anything. Time has passed so quickly and one day I started receiving Kakao messages from the president of Cal-Pac KUMw reminding us of new year celebration. Then I realized that I must take out my Han-Bok for the celebration day. On the day of the celebration, I dressed in Han-Bok which made me feel good and specially touched by the cool winter breeze in the morning. The newly built fellowship building standing tall greeted me as I walked in the La Palma United Methodist Church. They haven’t completed the fellowship building but the pastor Kim and the whole congregation agreed to let us use it as first guests. We are so blessed in the KUMW. When we were reciting “The Purpose of United Methodist Women” during the service, I was so moved. “United Methodist women shall be a community of women whose purpose is to know God and to experience freedom as whole persons through Jesus Christ; to develop a creative, supportive fellowship, and to expand concepts of mission through participation in the global ministries of the church.” Amazingly this sentence includes everything that we do as a Methodist women. Every time I read this I am so amazed and impressed by how it is arranged perfectly! Also, it reminds me that I was created by God’s plan. During the second session, we were blessed to attend a seminar offered by a young pastor Moonyoung Lee. Many of us were able to relate to the seminar’s subject, “Religious Heritage: Knowing and Doing”. 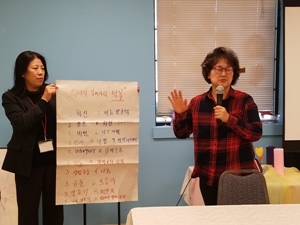 We were also challenged by the topic that most of us were aware of issues that our Korean-American young generations are leaving churches steadily. When we were discussing about the reasons of this issue, I felt like I was a perpetrator. I was questioning myself if I am a faithful mother leaving healthy religious inheritance to my two children. We all agreed that our generations are aware of the issues, but we are not doing anything about it. Unfortunately, I was one of them. During the seminar, we learned about how to tackle this issues in a very specific way. We learned that the major cause of young generations leaving churches are parent’s generations do not walk the biblical teachings at home. We ought to try to communicate with our children in efficient ways. Not just myway! To educate them, we must build a healthy relationship. We must compromise our priorities as well. Knowing logically is not going to help the issues but we must continuously act the way we learned by biblical teachings. Therefore, the young generations will not leave church and return to God. Although we dream and plan to become a new creation every year in January, we can’t be unless we are in Christ. 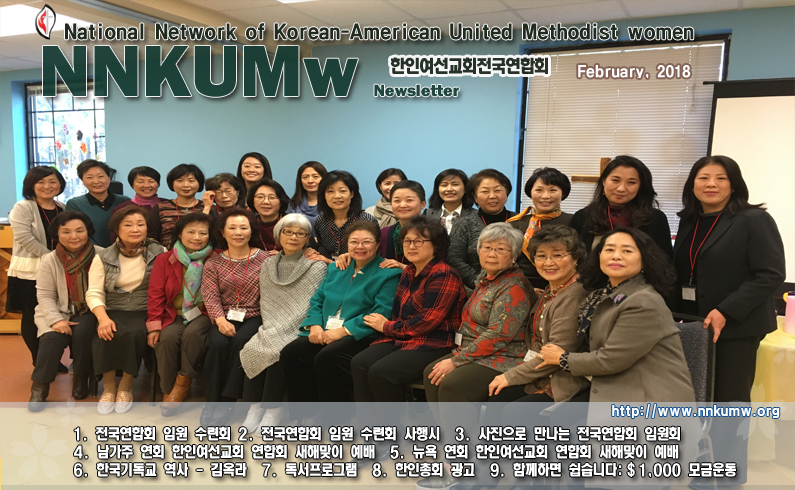 I pray for our Korean United Methodist Women that we plan everything in Christ that we serve as tools to glorify our father God!! 매년 새해가 되면 우리 모두의 마음이 늘 그랬듯이 무언가 새로운 것을 갈망하고 새마음으로 자세를 다듬고 더 나은 모습을 추구하며 성장하고 싶어하는 것 같습니다. 매년 1월 마지막 토요일에 다들 분주한 세상 일들을 제쳐 놓고 먼저 주님 전에 함께 모여 새로운 한해의 시작을 허락해 주심을 감사드리는 찬양과 경배의 예배로 모이게 해 주시니 얼마나 감사한지요. 뉴욕연합회 여선교회 임원들의 특유의 부지런함과 하나님 나라 선교의 열정은 어느 누구도 못 말리는 준비 과정을 통해 다시 한번 뜨겁게 느끼도록 해 주었습니다. 나의 개인 사정으로 수년간 참여 못하고 이번에 새로운 임원으로 같이 참여해 보니, 역시나 그래왔듯이 하나님을 향한 불타는 사랑과 식지않는 헌신의 열정은 거대한 뉴욕만이 아니라 이 넓은 세상이 좁다할 정도로 직접 선교사의 발로 뛰는 임원 여러분들... GREAT!!! 입니다. 특히 미국 서쪽 끝에서 오신 권혁인목사님의 평화 세미나를 중심으로 이뤄진 예배와 말씀 가운데 하나님 나라의 뜻(평화)을 창조역사, 경제윤리, 정치윤리와 평화의 목적과 선포를 통하여 알게 하실 때, 우리들의 삶속에서 실현시키기를 간절히 원하시는 성령님의 임재하심을 체험했습니다. 이번에 특별히 저에게 주신 말씀은 포도원 일꾼들의 품삯에 대해 모두에게 주신 한달란트의 의미를, 우리가 가진 경제관념적인 숫자로 보지 말고 하나님 나라의 시선-우리가 알고 있는 세상의 숫자와는 전혀 관계가 없는-으로 바라보아야 한다는 해석이, 늘 들어왔던 말씀임에도 불구하고 왠일인지 그순간 내 마음을 두드렸습니다. 우리의 꼬르륵 거리는 불쌍한 배를 위해 정성껏 준비해 주신 주님은 나의 목자 교회여선교 회원님들의 맛난 점심과 찰지고 쫀득 쫀득한 거대한 맛뵈기 옥수수, 그리고 동심으로 돌아가 선교 저금통을 열심히 만드시는 권사님들이 너무나 아름다웠습니다. 로마서 8:28에 "우리가 알거니와 하나님을 사랑하는 자 곧 그의 뜻대로 부르심을 입은 자들에게는 모든 것이 합력하여 선을 이루느니라" 주신 말씀이 그 순간 '이땅에도 임하옵시며' 라는 주기도문이 실현되는 시간이라 믿고 얼마나 기쁘고 감사했는지요. 이런 모습 가운데 하나님 나라의 평화는 막연하고 멀리 있는 것이 아닌 우리들이 있는 내 가족과 우리가 속한 교회와 어울려 몸으로 헌신하는 뉴욕연합회 여선교회로 부터 지킴이의 역할을 감당할수 있다는 것을 하나님께서 보여주신 2018년 새해맞이 예배였습니다. At the beginning of each New Year, we desire to renew our hearts, and to have new things better our lives and grow. Every last Saturday of January, we as members of the NYC KUMW Network get together to offer God our Thanksgiving Worship for the New Year. Due to personal circumstances, I left the Network for a while. Now I joined again as a new member of the officers and saw the same commitment; which is passion and love for missions for the kingdom of God. I felt compassion for each officer of the NYC KUMW Network for her diligence and passion in working together to prepare for the gathering. I also experienced the presence of the Holy Spirit in our midst, when our guest speaker, Rev. 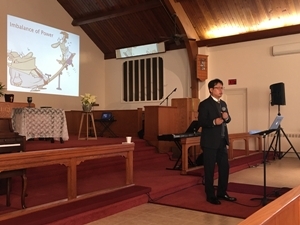 Hyok In Kwon, spoke about God’s Kingdom as Shalom in the creation history and in economic and political ethics in terms of proclaiming the purpose of peace. It is certain that we as Christians should live out Shalom life. Again it touched my heart when I heard the speaker talk about “the Parable of the Workers in the Vineyard”. The meaning of one denarius that each worker received after their day’s labor. We count the number of labor hours to calculate how much we get paid. But the kingdom of God calculates it in a totally different way that has nothing to do with the way we figured. Following the worship and the general meeting, we had a delicious lunch prepared by the members of the KUMW of the Shepherd UMC. The taste of sample sweet corn was excellent. After lunch, we as a group, made piggy banks out of small boxes and decorated the boxes. It was beautiful to see everyone enjoying the fellowship by talking, laughing and sharing. We made piggy banks to collect coins and dollar bills throughout the year, to support our mission work in Central Asia. In Romans 8:28 it says, “And we know that in all things God works for the good of those who love him, who have been called according to his purpose”. I was so happy to see that this verse was realized in the moment at our gathering place as well as the Lord’s Prayer, “Thy will be done in earth”. I experienced the ‘peace’ among us and realized that the peace of the Kingdom of God is not far away but is amid us, in our families and in our churches. As we gather in the name of our God, through our commitment and dedication to the mission work that God calls for, we experience ‘Shalom’. And that is what God has shown me throughout the day of our gathering at the 2018 New Year’s Worship Service. 김옥라는 1918년 강원고 고성군 간성면에서 아버지 김락선과 어머니 최은사의 6남매 중 둘째 딸로 태어났다. 기독교와 근대문물의 유입로인 원산항과 가까운 그녀의 고향 간성에 전해진 기독교는 그녀의 집안에도 전파되어 김옥라는 어려서부터 기독교 신앙 안에서 성장할 수 있었다. 간성공립보통학교를 졸업한 후, 집안 형편의 어려움으로 학업을 중단할 수밖에 없었지만 김옥라는 상급학교 진학에 대한 꿈을 버리지 않았다. 이후 농한기인 겨울에 3개월만 운영하는 성경학교인 원산의 보혜 여자 성경학교에 입학하게 되는데 그녀는 이곳에서 그녀 인생의 최고의 스승을 만나게 된다. 40년간 한국에서 선교하시며 수많은 전도부인을 길러냈고 감리교 여선교를 길러내신 성경학교 교장인 쿠퍼(S.K. Cooper, 거포계)선교사와의 만남은 그녀의 인생에 큰 전환점이 되었다. 강원도 시골 소녀에게 신앙과 사랑을 먹여주신 하늘의 천사로 비유한 거포계선교사님의 추천으로 마침내 감리신학교에 입학 할 수 있는 길이 열렸다. 늘 배움에 목말랐던 시골 처녀 김옥라는 감리교신학교에서 기숙사 생활을 하며 마음껏 지식을 습득하고 감성을 살찌울 수 있었다. 중일전쟁 이후 신학교에 휴학계를 내고 철원 기독교사회관에서 아이들을 가르치며 일본이나 미국으로의 유학을 꿈꿨으나 이마저도 전쟁의 여파로 선교사들이 강제 추방되면서 사회관도 문을 닫는 지경에 이르게 된다. 나라 잃은 민족의 설움과 고통을 뼈저리게 느끼며 1941년 봄 우여곡절끝에 일본유학길에 오른다. 간성에서 원산으로 그리고 서울과 일본유학으로 이어지는 학문 여정에는 고비마다 물심양면으로 도와주는 손길이 있었고, 그 경험은 그녀가 세상에 봉사하는 삶을 살도록 하는 원동력이 되었다. 도시샤 여자 전문학교 영문과에 진학한 김옥라는 제2차 세계대전의 광풍 속에서 어렵게 학업을 마치고 해방 이후 조국으로 귀국하지만 38선 이북의 고향 간성으로는 돌아갈 수 없었다. 대학 졸업 이후 김옥라는 미군정청에 취직하여 사회생활을 시작했다. 영문과를 전공한 그녀는 번역과 통역을 맡았으며 미국 체육 교사가 쓴 초. 중.고등학교 12학년의 체육 교과서를 번역하였고, 이화여대 학생들에게 통역을 가르쳤다. 이승만 정부 시절에는 외자청에서 외자도입 업무를 맡기도 했다. 미군정청과 중앙행정처에서 습득한 행정 능력은 이후 그녀가 전국적이고 국제적인 단체들을 운영하고 확장해 나가는데 매우 중요한 경험이고 도구가 되었다. 한편 미군정청에서 근무하는 동안 평생의 반려자 라익진을 만나게 되는데 남편 라익진은 1986년 가정법률상담소가 제정한 ‘제1회 외조 공로상’을 수상할 만큼 그녀의 든든한 후원자가 되어주었다. 한국전쟁 중 김옥라는 공무원직을 그만두고 걸스카우트 운동을 시작한다. 오랫동안 마음에 품고 역량을 갈고 닦았던 나라 사랑과 사회봉사의 길에 들어선 것이다. 피난지 부산에서 일본어로 발행된 걸스카우트 안내 책자를 우연히 접한 그녀는 실무자가 없어 표류하고 있던 걸스카우트 운동에 매진하게 된다. 전쟁의 폐허 위에서 새롭게 일어서고 있는 한국의 걸스카우트에 세계적인 조직망을 가지고 있는 걸스카우트 세계연합회는 지지를 보내 주었고 1963년 한국걸스카우트는 정회원이 될 수 있었다. 1967년 걸스카우트 상근직에서 물러난 김옥라는 감리교신학교를 중퇴할때 “ 제가 기초 학문을 탄탄히 한 뒤 정말 멋있게 신학을 연구하겠습니다”라고 하나님께 한 다짐을 떠올리며 연세대학교 연합신학대학원에 입학하였다. 식지 않는 학문의 열정으로 1971년 신학 석사학위를 받을 때 그녀의 나이 54세였다. 김옥라는 1967년 한국교회 여성연합회가 창립될 때 부회장을 맡았고 이어 2대 회장으로 봉사하면서 한국 교회 여성을 위한 애큐메니칼 운동(Ecumenical Movement : 세계교회의 실현을 지향하는 운동)의 기초를 닦았다. 1974년 감리교 여선교회 전국연합회 회장에 당선되어 1982년까지 8년간의 회장 임기 중, 교단의 분열 속에서도 중립을 지키며 하나로 뭉쳐 선교사업에 총력을 기울이며 감리교회의 미래를 선도하였다. 또한, 한남동에 여선교회관을 건축하여 한국 감리교회 여성운동의 지평이 세계로 뻗어 나가는 쾌거를 이뤘다. 1976년 세계감리교 여선교회 대회에서 동남아시아 회장에 피선되었고, 1981년 세계감리교 여성연합회(World Federation of Methodist Women) 회장에 선임되었다. 이 땅에 기독교 복음이 전해진 지 한 세기가 지나 드디어 세계감리교회 여성운동을 위한 리더쉽이 한국 교회에 주어진 뜻깊은 사건이었다. “어려운 시절 공부하면서 도움받은 사람들과 세상에 조금이라도 빚 갚는 마음으로, 그리고 앞으로 세상이 더 나아지기를 날마다 기도합니다” 라는 100세 청년 김옥라, 그녀는 오늘보다 더 나은 내일을 이루기 위해 오늘도 부단한 자기훈련과 사회봉사의 걸음을 힘차게 내디디고 있다. Ok-ra Kim was born in 1918 in Gosung County of Ganseong, Gangwon Province as the second daughter of Rak-seon Kim and Eun-sa Choi. 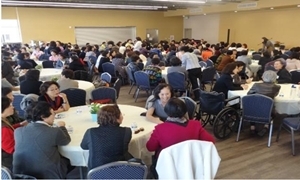 An influx of modern culture introduced Christianity to her home town, near Wonsan Port. Her family embraced the Christian faith early on. And that made it possible for Ok-ra Kim to grow up in the Christian faith from young age. After graduating from Ganseong Public School, Ok-ra Kim was forced to stop studying due to destitute family situation. However, her goal to attend a secondary school was never abandoned. 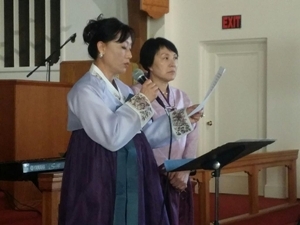 She then entered Wonsan Women’s Bible School that operated for only three months during the agricultural off-season. During her attendance there, she met S. K. Cooper, one of the best teachers of her lifetime. 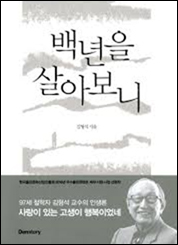 He was the Bible school principal and a missionary, who trained many Bible women for forty years in Korea. Surprisingly, meeting her became a turning point in Ok-ra’s life. With the recommendation of a missionary teacher who was like an angel to Ok-ra, she was able to enter the Methodist Theological Seminary. Having always been eager to learn, Ok-ra gained knowledge and emotional support while staying in a dormitory at the Methodist Theological Seminary. After the Sino-Japanese War, Ok-ra took a leave of absence from the seminary, taught children at the Cheorwon Christian Community Hall and dreamed of studying abroad in Japan or the United States. But it was a turbulent time when the missionaries were forced out of the country in the wake of the war. Feeling deep sorrow and pain of her lost nation, she went to Japan in the spring of 1941. 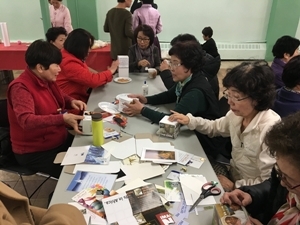 During her study at Ganseong, Wonsan, Seoul and Japan, there were many helping hands for her spiritually and financially. Those experiences became a driving force for her to live a life of service to the world. Ok-ra Kim studied at the English Department of Doshisha Women’s College and returned to her home country when Chosun was liberated from Japanese occupation at the end of World War II. But it was impossible for her to go to her home town which was in the north of the 38th parallel. After graduating from college, Ok-ra Kim started her career by getting a job in the U.S. Military Academy. Since she majored in English, she was able to translate middle and high school (12th grade) physical education textbooks and taught English to Ewha Women’s University students. During the Rhee Seung-man administration, the foreign affairs agency also took charge of introducing foreign investment. The administrative skills gained at the US Military Academy and the Central Administration became a very important experience and tool for her to operate and expand national and international organizations. Meanwhile, working for the US Military Service Office, she met a life partner, Ra, Ikjin. Her husband had been her strong supporter. And he received the "1st Outstanding Achievement Award for Supportive Husband" by the Family Law Consultants. 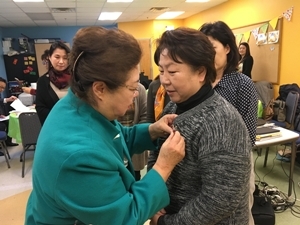 During the Korean War, Ok-ra Kim quit her job as a civil servant and began the Girl Scouts movement in Korea. She entered the road of love and community service, which had long been a center of her thought and ability. Then, she stumbled upon a Girl Scouts brochure that was published in Japanese while living as a refugee in Busan. She realized that the Girl Scouts movement was dwindling due to lack of volunteers and decided to devote herself to the movement. The Girl Scouts World Federation, which was a global network and was newly rising on the ruins of war, gave support to the Korean Girl Scouts, and in 1963, the Korean Girl Scouts became a full member of the World Federation. Ok-ra Kim resigned from Girl Scout full-time work in 1967. Since dropping out of Methodist Theological Seminary, she never abandoned her plan to study theology and finally decided to pursue her goal. But first, she thought she had to be competent in basic academics. At last, she enrolled at Yonsei University Seminary with a pledge to God. She was fifty-four years old when she received a master’s degree in theology in 1971 with her undying academic zeal. 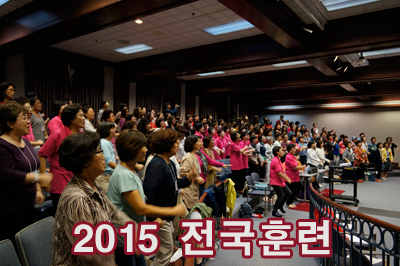 The Korean Federation of Church Women was founded in 1967 and Ok-ra served as its vice president. While serving as its 2nd president, she paved the foundation for the second largest ecumenical movement for women in Korea. 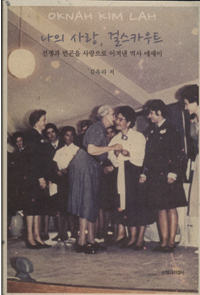 She served as the president of the Woman’s Society of Christian Services of Korea for eight years until 1982 and led the Methodist Church's future by staying together in a non-committal stance. 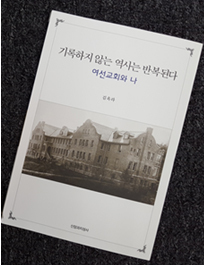 In addition, she played an important role in building an office for Korean Methodist women in Hannam and achieved an impressive success in spreading the women’s movement of Korean Methodist Church. She was appointed as the president of Southeast Asian chapter of the World Federation of Methodist United Church Women in 1976 and its worldwide president in 1981. 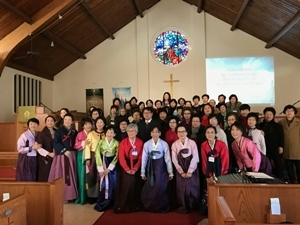 It was a significant event that leadership for the Methodist women’s movement was given to Korean church a century after the Christian gospel was brought into the land. Ok-ra Kim, who started the Center for the Advancement of Social Welfare in 1986 by concentrating on the work for Korean women in the church for more than 20 years, established a fundraising foundation for each social welfare corporation and established a volunteer service of more than 10,000 people. "With determination to repay the people who helped in difficult times and make the world a better place to live," Ok-ra Kim, a 100 years old young woman, lives a life of endless self-discipline and social service even today. 얼마 전, 어느 TV프로를 보다가 김형석 교수를 보고 깜짝 놀랐다. 99세라는 나이임에도 너무나 꼿꼿한 외모는 물론이고 2016년 한해 동안에 170여 번의 강의를 했고, 몇권의 책도 썼다고 했다. 몇 명의 젊은 지인들에게 김형석 교수를 아느냐고 물어봤더니 고개를 갸우뚱한다. 그도 그럴것이 그는 100년 전에 태어나신, 우리나라 1세대 철학자이다. 교육자이고 수필가이다. 100년의 세월을 산 철학자가 우리들에게 들려주고 싶은 이야기가 무엇일까? 인생의 선배이자 신앙의 선배인 그분께 들어야할 인생은 어떤 것일까? 인생의 진정한 행복이 무엇이고 성공이란 무엇일까? 죽음과 영원에 대한 사유는 무엇일까? 스스로 살아본 인생을 돌이켜 깨달은 삶의 비밀들을 우리들에게 다정하고 나지막한 소리로 들려준다. 가정에서 일어나는 문제는 물론 사회생활에서 모두가 겪어야 하는 과제들, 그리고 인생의 의미와 죽음에 대한 관심까지, 일상에서 부딪히는 문제들을 지혜롭게 판단하고 처리하는 삶의 지혜를 제시한다. “인생은 늙어가는 것이 아니라 익어가는 것"이라고 저자는 말한다. 그리고 ’뒤돌아보면 인생은 힘든 과정이었지만 사랑이 있는 고생은 행복이었다"고 고백하며 그것을 깨닫는데 90년이 걸렸다 말한다. 젊었을 때 몰랐던 것을 나이를 먹으면 알게 되는 것이 있다. 더 나이를 먹으면 인생은 또 다르게 보인다. 만약 우리가 백년을 산다면, 우리는 어떤 모습이 되어 있을지 생각해 본다. 시대의 지성인, 저자가 삶을 관통하는 철학적 사유를 통해 우리를 일깨우는 이야기에 귀를 기울여보자. 누군가 그에게 ‘100년을 어떻게 살았느냐고 묻는다면, 나는 사랑하기 위해 살았노라’고 대답할 것이라는 그의 말이 묵직한 울림으로 남는다. A while ago, I was watching a TV program and was surprised to see Professor Hyung-Suk Kim. Though he was 99 years old, not only did he have a straight posture, but also he said that he had lectured around 170 times and written several books during 2016. When I asked some of my young acquaintances if they knew who Professor Kim was, they tilted their heads to the side. No wonder, he is the nation’s first-generation philosopher who was born 100 years ago. He is an educator, and an essayist. What story does a philosopher who lived 100 years want to tell us? What kind of life should we listen to, from a senior in life and faith? What is the true happiness of life and what is success? What is the reason for death and eternity? He turns back his life and reveals the mysteries of living to us in a friendly and quiet voice. He presents life’s wisdom that wisely judges and deals with the problems that arise in everyday life, from the issues that occur in the home as well as the challenges that everybody must face in society, to the meaning of life and the concern for death. “Life is not getting old, but it is ripening” says the author. He confesses that it took 90 years to realize that “looking back, life was a hard process, but the pain with love was happiness.” There are things that you learn when you get old that you didn’t know when you were young. Life seems different when you are older. If we lived a hundred years, I wonder what we would be like. Let’s listen to the stories that the intelligent man of the time, the author, who awakens us through philosophical thoughts that penetrate life. The author said if someone asked him how he lived a hundred years, he would answer “I lived to love.” His words remain with a heavy resonance upon my own life. 사랑하시는 가정과 섬기시는 교회와 사역에 하나님의 평강이 충만하시길 기원합니다! 목회자와 평신도 사이의 다리를 놓는 꿈을 꾸면서 성장해 왔습니다. 상황에서 우리들의 가야 할 방향을 함께 모색하는 소중한 만남이 될 것입니다. 특별히 한인교회에서 목회하시는 목사님들은 한인총회 오실 때 평신도 대표를 꼭 모시고 오시기를 간곡히 부탁드립니다. 현 교단의 상황에서 우리들의 가야할 방향을 모색하고 결정함에 있어서 목회자와 평신도가 함께 연합해서 대처해 나가는 것이 가장 올바른 길이기 때문입니다. http://kaumcblog.wordpress.com/register/ 에서 등록을 하실 수 있습니다.